To all those who left comments on my last post, thank you! I hadn't really expected to be gone this long and had hoped to respond to all the lovely comments. After everything with my dad happened life just seemed to be very busy, and I felt caught up in it all, rarely even checking my email. For the past several days this one image has been sitting in my Photo Shop program just waiting to be edited. Finally I took a few minutes and did just that. Once it was done I added a sweet border on PicMonkey. They just keep adding new editing options and I love them all! Please know I am very thankful for everyone who visits my little blog. Hopefully I will be back again very soon! I trust your Dad is doing better now? Don't forget to take care of yourself during this time of uncertainty. This is a lovely image of your rose. Glad to see more beautiful blossoms on your blog, Sharon. You have the knack for taking the most awesome photos! Hope your Dad is continuing to improve! Beautiful. I need to spend some time experimenting with picmonkey more. So very glad your Dad is better. And you already know I love your Instagram. I wish I was better at it! I would love to try this program someday soon Susan. I love the sweet border on your beautiful rose. Your wisteria in your last post are lovely! Thank you for visiting - it's been a very long time. I'm so glad your dad is ok. I know how scary that is to have a parent in the hospital. My mom isn't in the best health so it's a worry all the time about what the next thing will be with her. Your photos are so beautiful. Wisteria grows wild all around me but I've never been successful in growing it myself. 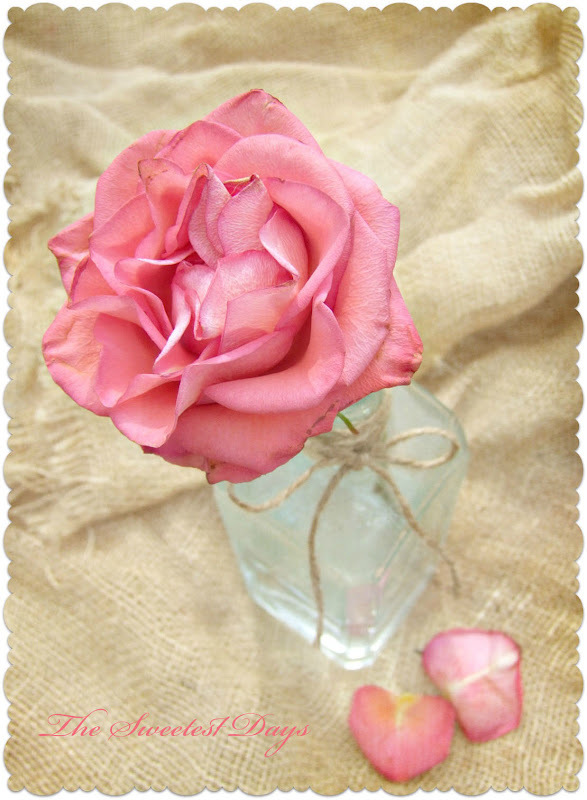 I love the burlap background -it shows off your beautiful roses nicely. I'm glad your dad is better. Oh wow! This is beautiful, Sharon!